Our Extruded aluminium frames are new to our product range and are manufactured mainly for our standard safety symbolic signs. ANODISING : This process makes the top layer of the aluminium porous. It is sealed, making it safe from the environment . THICKNESS & MOUNTING : The width of the frame is 20mm and there is a 5mm lip around the edge of the frame that the sign is recessed behind. 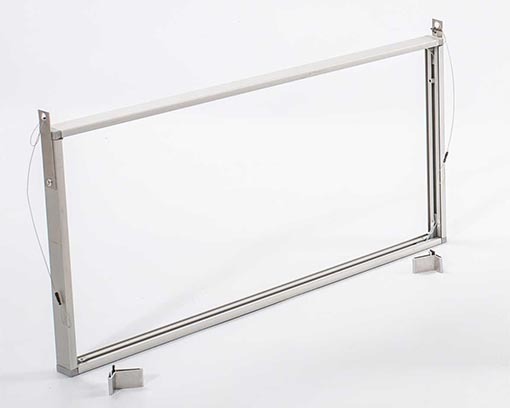 The frame comes standard with 2 brackets for either wall or ceiling mounting. If more brackets are required they can be riveted on at your request. We also make ceiling hooks and chains for frames to be suspended at an additional cost. SIZES : 150 X 150mm, 150 X 300mm, 150 X 450mm, 150 X 600mm. 190 X 190mm, 190 X 380mm, 190 X 570mm, 190 x 760mm. 290 x 290mm, 290 x 580mm, 290 x 870mm, 290 x 1160mm. 440 x 440mm, 440 x 880mm.